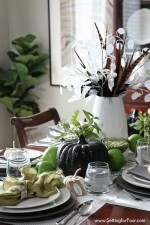 Remember when I decked out my home with lots of autumn goodness for my Fall Home Tour last month? 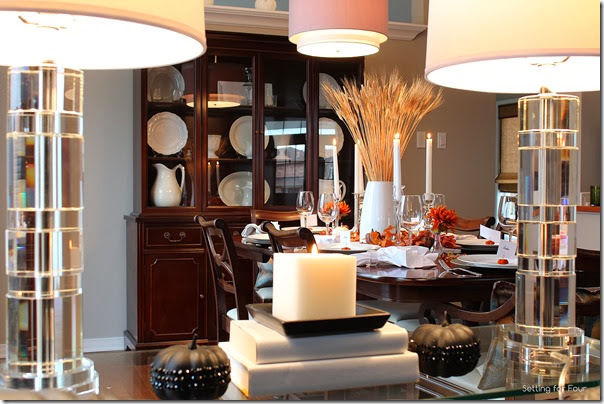 Well today I’m giving you a better look at my dining room and sharing how I decorated my ‘Bountiful Harvest’ Thanksgiving table! This is our mahogany dining room suite! It’s old and has a beautiful patina; it’s well loved and has given us lots of wonderful memories of holidays, families and friends. My husband inherited this set and it’s moved to 7 different homes on 7 different military postings. No matter where the military might move us our dining room is always one of the first rooms to get set up and arranged. Ready to welcome visiting family members, new friends and old friends too! New peacock print colored pillows ^^^^^^ . Tones of turquoise, navy blue and gold! 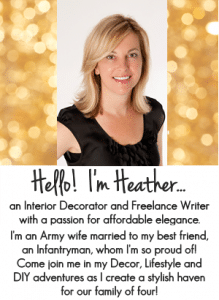 I love, love, love my sparkly crystal lamps – a Homesense score! 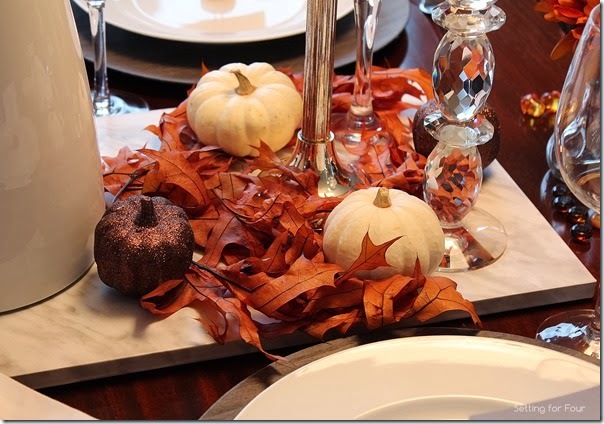 DIY crystal glam pumpkins on the sofa table! 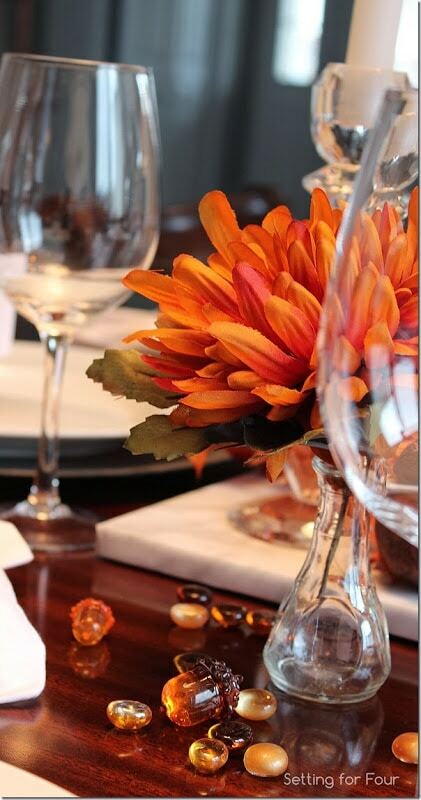 I added pops of orange with these gorgeous mums in mini vases and fall ‘table gems’. 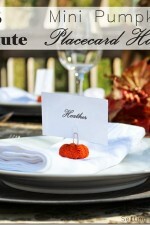 5 Minute DIY Mini Pumpkin Place cards – whip these up for your thanksgiving guests in minutes! 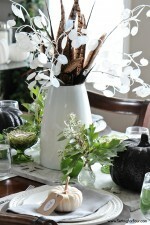 Baby boo and glitter pumpkins, copper colored leaves sit on a marble slab centerpiece. 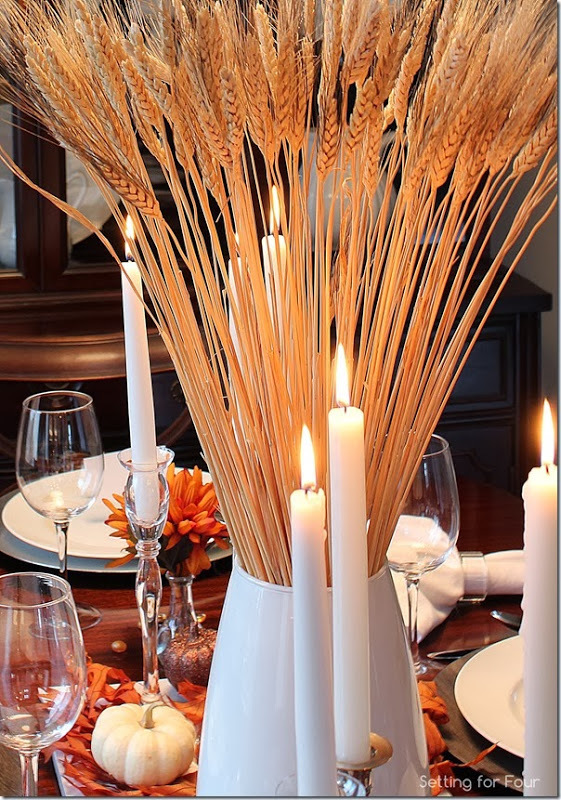 This large scale wheat centerpiece in a modern white vase is the perfect touch to a Bountiful Harvest table. 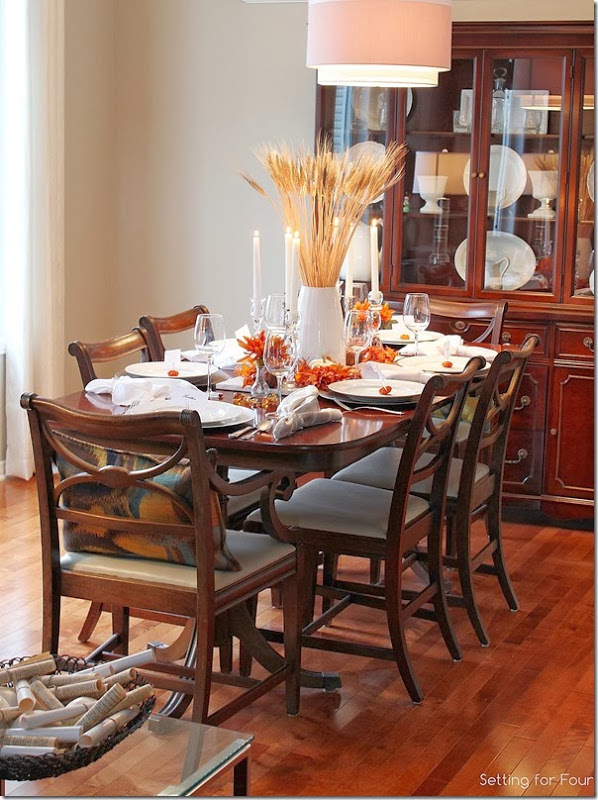 Have a seat – Thanksgiving dinner is almost ready! 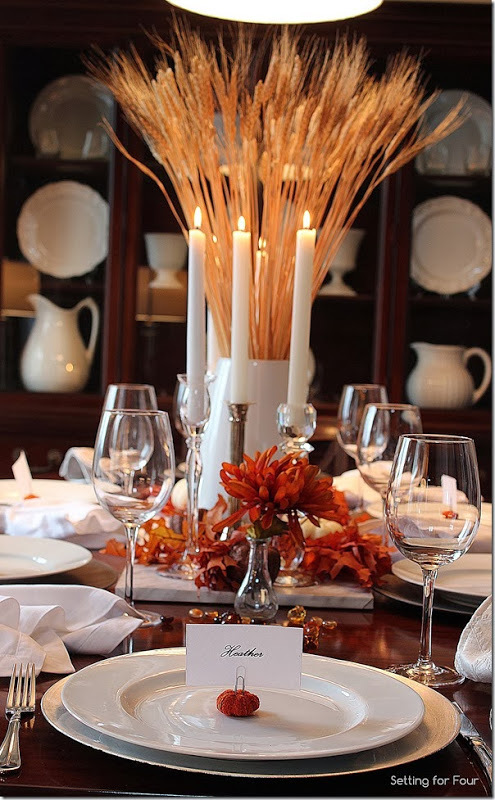 I want to wish all of my readers and bloggy friends the very Happiest Thanksgiving! I hope you all have a thankful day filled with wonderful food, loving family and loving friends! 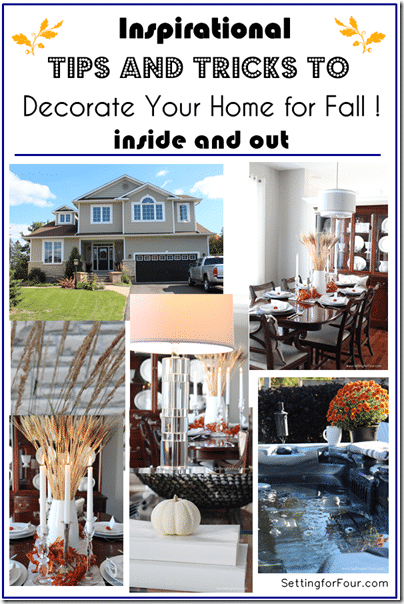 If you missed it, see more of my home here: Inspirational Tips and Tricks to Decorate Your Home for Fall Inside and Out! I’m so thrilled to be celebrating Thanksgiving today with some of my fun bloggy friends in ‘A Bountiful Harvest’ Blog Hop! 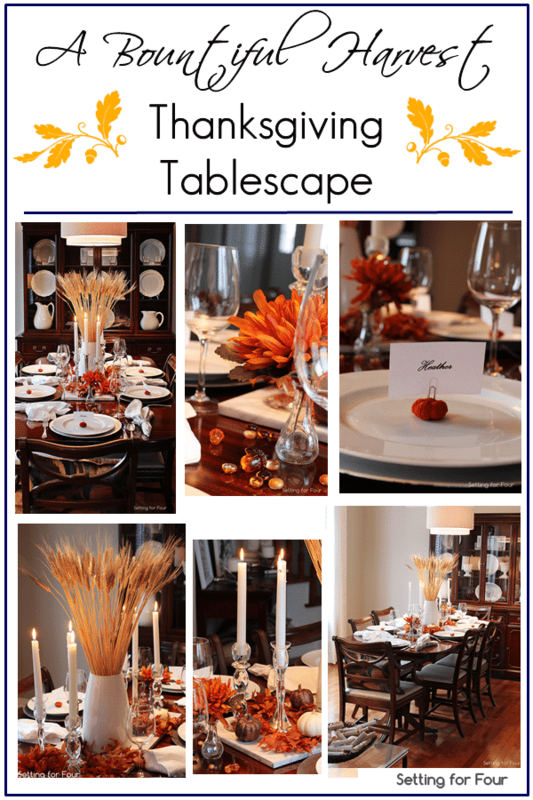 Be sure to visit their blogs today for lots of Thanksgiving inspiration! 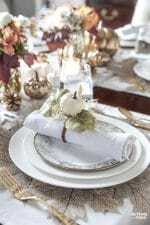 Your table is absolutely stunning! love the wheat mixed with the crystal! The table is absolutely stunning! 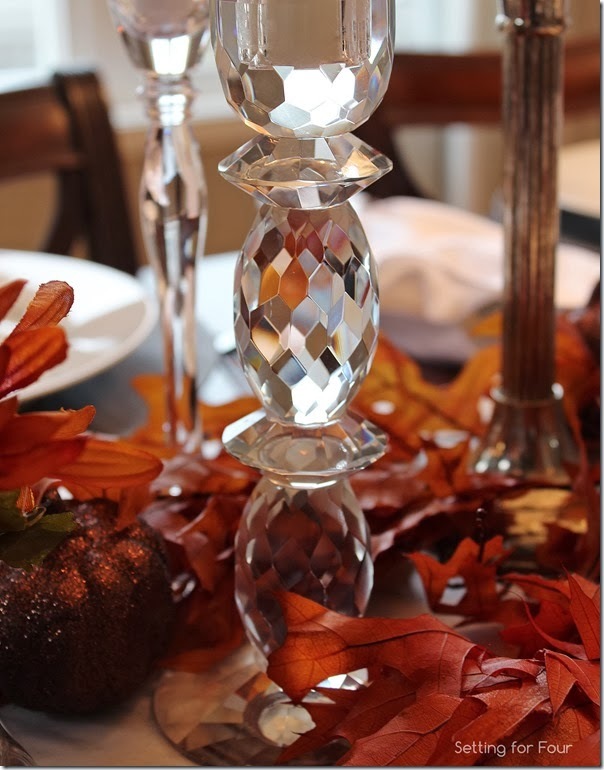 I love all the cut crystal, shimmer, and shine! Thanks Kim- I’m thrilled that you like it! So pretty Heather! Love the ironstone! 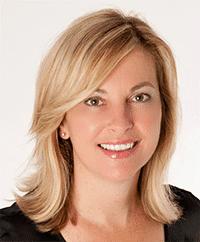 Thanks Kristin – I hope to collect more pieces and create a gallery wall around my dining room cabinet/hutch! LOL – I’d love to have you over for dinner Christine! Come over any time!!!! It’s absolutely beautiful Heather!! I love the pops of orange against the white! 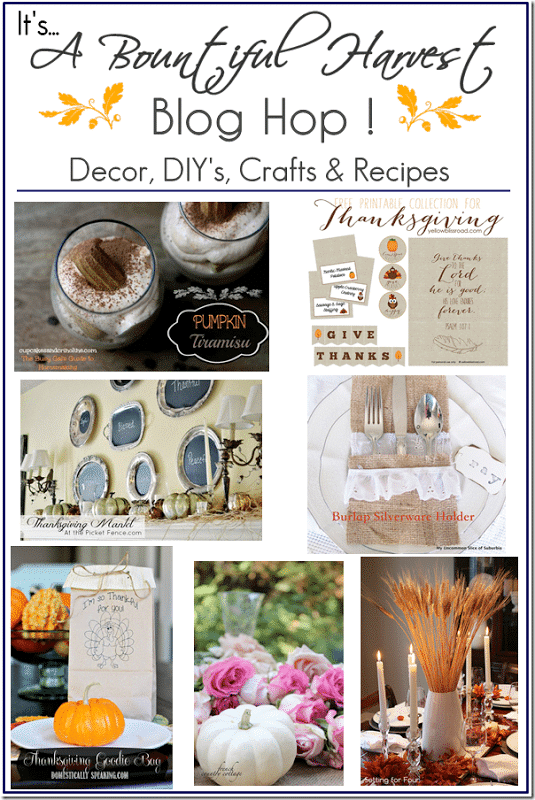 So fun being apart of this blog hop together! 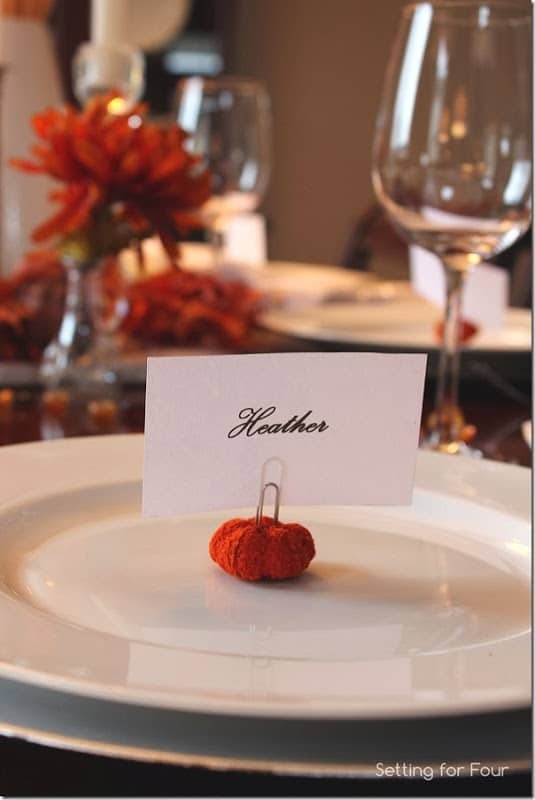 Such a beautiful table setting, Heather. So warm, inviting and stunning! So happy to be partying with you. Well, it is an amazing table setting and no one can stop staring at this. 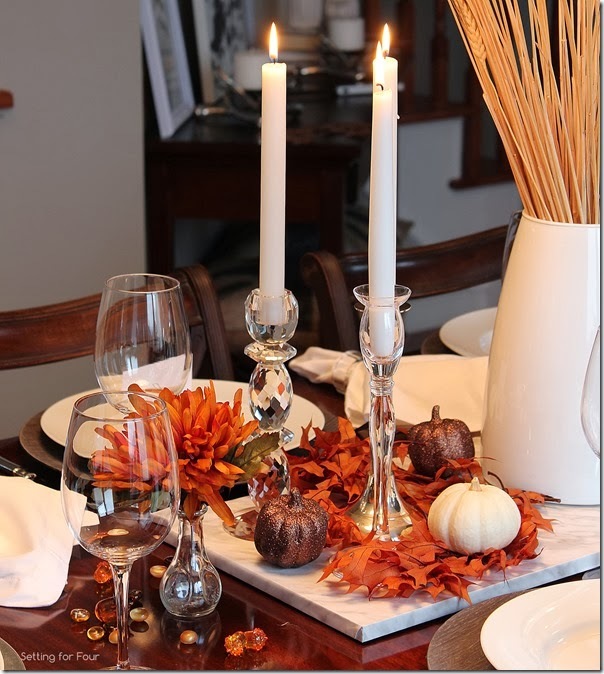 Your post’s focus on craft can be seen greatly through the picture and I must say it is perfect use of marble handicraft items to decorate the table and to bring perfection and beauty as well. 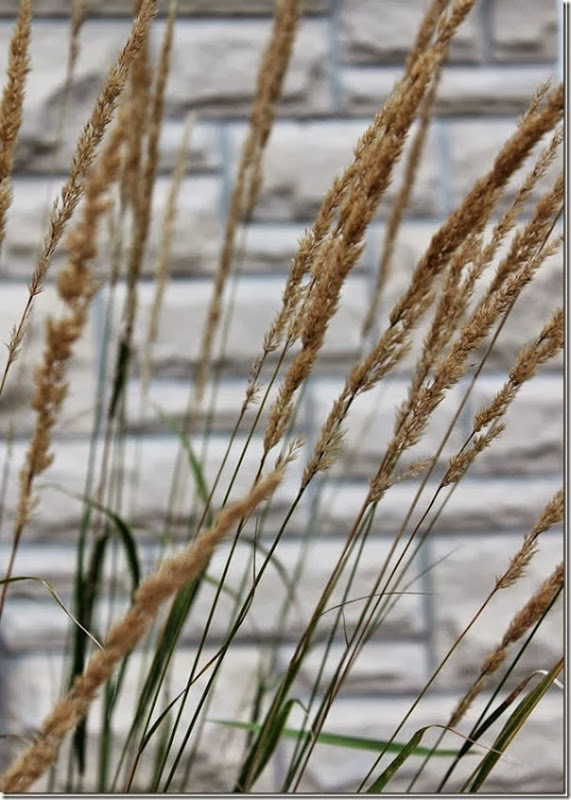 I loved the way the overall setting has been applied really. Heather – Thank you so much for sharing your fantastic project on The Inspiration Board at homework. I featured you today! Have a great weekend. 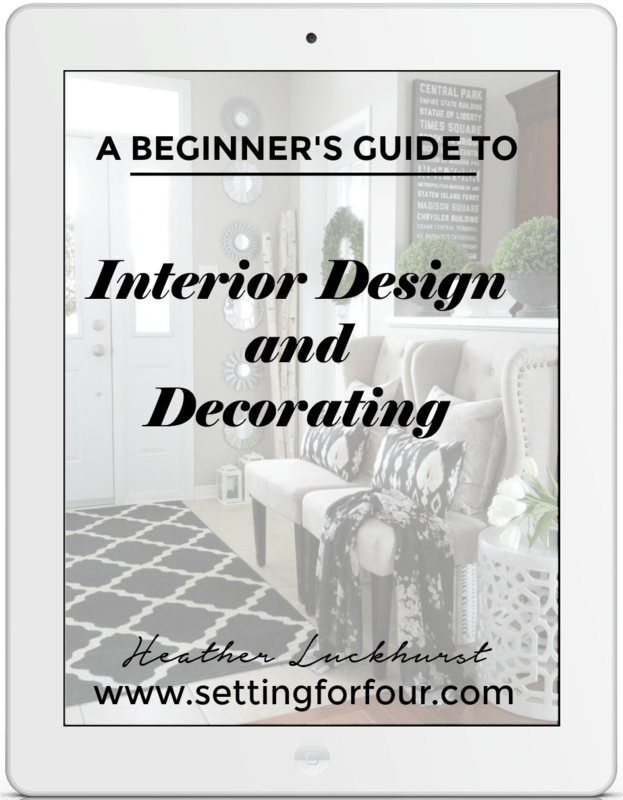 Everything in your room looks fantastic! 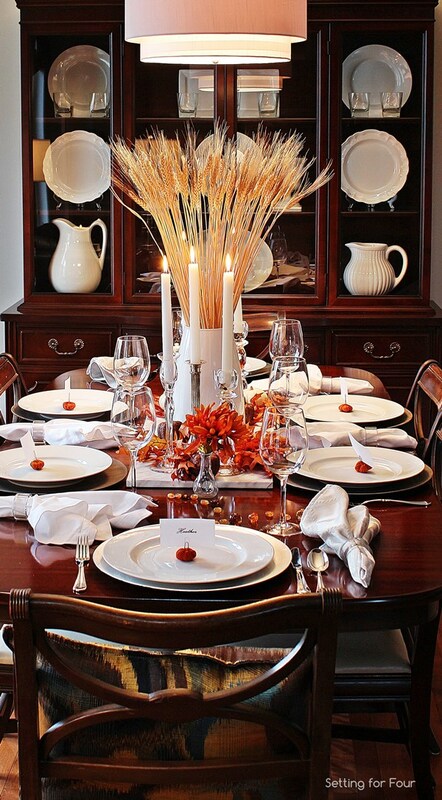 I love the autumn colors and the lux look to your tablescape. What a BEAUTIFUL table!! So beautifully arranged and put together! Beautiful!